Mandevilla 'Pretty Crimson'. Photo from Sun Parasol. In a previous article, we told you that using annuals in your Buffalo area garden can help give you constant bloom. Today we’ll tell you about three more great annuals that work well in containers. These suggestions were provided by the staff at Lockwood’s Greenhouses, 4484 Clark Street, Hamburg, NY 14075. “These are some of the best plants you can have,” said Jill Kisker, grower at Lockwood’s. The flowers of the mandevilla have a lovely shape and come in brilliant colors. 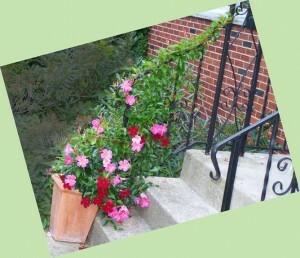 The mandevilla is a vine that looks lovely trailing from a hanging basket. It can be just as beautiful trained to grow upright in a container, supported by a small trellis or canes, as seen in the first photo. Another charming way to display it is by allowing it to twine up a railing, as Kisker has done at her own home, below right. Mandevilla can take full sun. Mandevilla twining up a railing. Photo by Jill Kisker. “The more sun you give it, the better,” Kisker said. They like hot, dry weather, too. Look for three groups of mandevilla. The mandevilla Giant Series has, as you can guess from the name, a larger flower and larger leaf than the plants in the other series. Its vining habits are very aggressive and will vine around whatever it can. 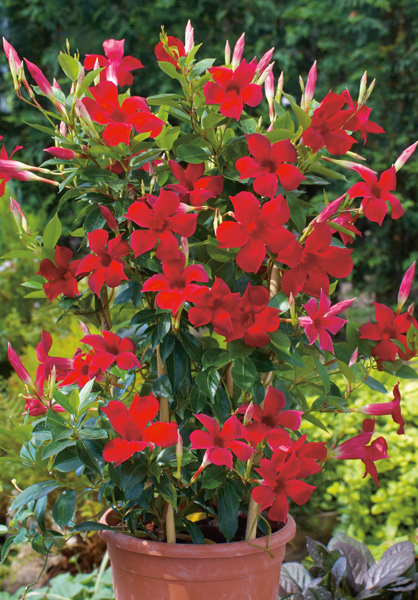 The mandevilla Original Series has a slightly smaller flower and leaf and its vining habit is the least aggressive. Kisker’s favorite is the Pretty Series, pictured at the beginning of this article, which has the smallest flowers, but gets the most flowers. Its vining habit is less agressive than the Giant and more aggressive than the Original. Breathless Blush Euphorbia. Photo from Ball Horticultural Company. Euphorbia has become popular in the last few years, and it’s easy to see why. 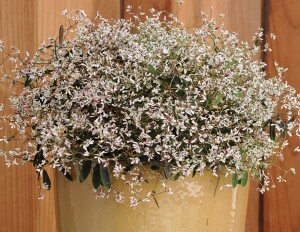 It has tiny, delicate flowers and reminds me of baby’s breath. It’s a great filler for containers and looks great when you combine it with large, brightly colored flowers. You can also plant it in a flower bed. Euphorbia takes part shade to sun. Teresa Buchanan, general manager at Lockwood’s, noted that they use euphorbia with poinsettia at Christmastime for a lacy look. You might be able to overwinter euphorbia if you bring it inside and have it in a window that has a lot of sun. Grasses can add interesting shapes, textures and even colors to containers as well as to garden beds. Pennisetum 'Fireworks'. Photo from Proven Winners. 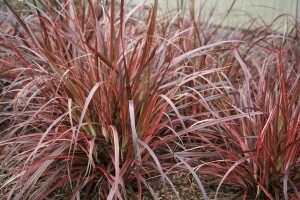 This is pennisetum ‘Fireworks’, a variegated red fountain grass. While some pennisetums are perennials, this one is an annual. It can take the hot sun. In the spring, the foliage is striped in pink, white and green, Kisker said. In the summer, it turns darker and is more red and pink. Adding even more interest, Fireworks gets a pink, plume-like flower. In an upcoming article, we’ll talk about a black annual, a shade annual and a drought-tolerant annual. Good Jill mentioned the ornamental grasses. They add so much texture and form to containers as well as the general landscape. I purchased a beautiful pink mandevilla from wonderful Urban Roots 2 years ago. Not being one to let anything go, especially a plant as gorgeous as this, I dug it up at the end of the season, pruned the roots and cut down the vines to about 3 inches. It has overwintered wonderfully and vigorously produced new shoots, some of which are over 2 ft long. The first fall I took a cutting, but it took so long to grow that I didn’t even get one flower this past summer. I think it will do better this time since it’s a more mature plant. That’s my hope, anyway! Grasses are something I wouldn’t think to use in a container. I think a lot of us probably overlook them. That is so cool! Keep us posted! Where can I buy a mandevilla in the Buffalo ny? To find out who has a particular plant in stock, contact the garden centers directly. You can see the ads of our Premium Partners in the right hand column of our website. When you click on the ad, you will go to their website to find all their contact information. Also check out their pages under Garden Resources and listings in our Gardening Directory.